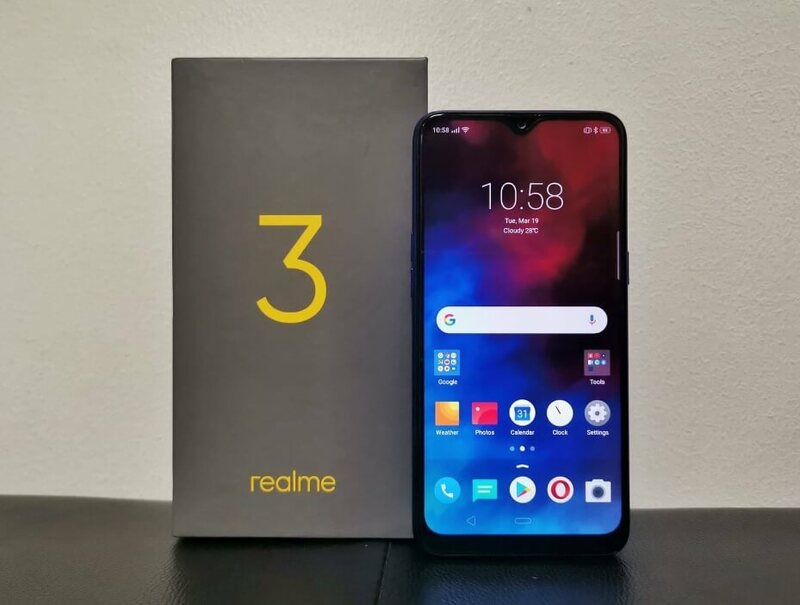 Realme launches today in the Philippines its second handset offering in the country, the Realme 3. Bringing in some impressive features with unbelievable asking price starting at only Php6,290. The Realme 3 offers 6.22-inch dewdrop display with 19:9 aspect ratio, resolution of 1520 x 720 pixels, and topped with Corning Gorilla Glass 3 for added durability. It is housed in a polycarbonate unibody casing with gradient glossy finish. On the inside, it is powered by octa core Mediatek MT6771 Helio P60 chip, which is based on 12nm FinFET process, paired with up to 4GB of RAM and 64GB of internal storage. It runs on ColorOS 6 based on Android 9.0 Pie out of the box, making it the first device from both Realme and OPPO to have such an operating system. Meanwhile, the camera department boasts a dual-rear shooters composed of a bright 13MP f/1.8 sensor plus a 2MP depth sensor, while another 13MP snapper is mounted in the front for taking selfies. These cameras are equipped with AI capabilities for more realistic and beautiful photos. In addition, Realme also introduced two shooting modes that will WOW the users, the Chroma Boost and Nightscape. This handset is also equipped with a huge 4230mAh battery with fast charging capability, and includes a 10W charger in the package. The other specs worth mentioning are the triple card slot, physical fingerprint sensor, face unlock feature, and USB on-the-go functionality. 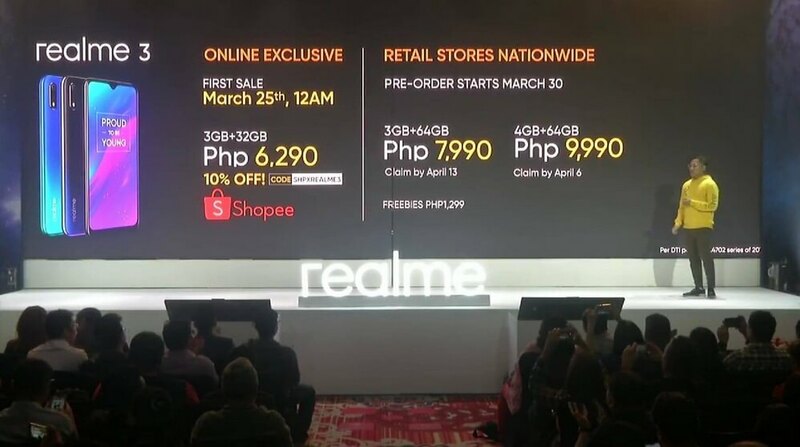 The Realme 3 comes in three variants, the first one is a 3GB RAM + 32GB of storage, which will be the first device to become available in the Philippines. It will arrive exclusively via Shopee on March 25 at exactly 12MN with an asking price of only Php6,990. But, consumers will be treated with 10% discount with the use of SHPXREALME3 voucher code, lowering down the price to unbelievably 6,290 pesos only! The two more models, the one with 3GB+64GB and 4GB+64GB will be available via physical retail stores nationwide with an asking price of Php7,990 and Php9,990 respectively. The pre-order starts on March 30 with freebies worth Php1,299. Availability of the latter is April 6, 2019, while the former will arrive a week after on April 13.